I remember the first quilt I ever made. It was a t-shirt quilt made up of all the t-shirts I had collected throughout junior high and high school. It was a project I tackled as a senior in high school and it was a really big job. It required a lot of measuring, re-measuring and cutting. It took forever and it has so many great memories that I love to look back on. But it was not a great choice for a beginner sewist. *This post is a sponsored post and does contains affiliate links for products that I personally use. I do make a small percentage if you purchase. See full disclosure here. I’ll admit that I’ve only tried a couple of quilts since then. Not because I can’t but I think I have a little stigma in my brain that quilts are way too much work. They require a lot of planning, measuring and cutting. Plus, making my first quilt turned out to be a lot more work and frustration than I thought it would be. That put a bit of a damper on my future thoughts of quilting. But creating a Cricut Maker quilt sounded like something I could do. That is why I was excited to try out the Riley Blake quilt kits that are specifically for the new Cricut Maker. Cricut has simplified the quilting process. Instead of spending tons of time cutting out squares, hoping they are all the same size, trimming, pinning and unpinning you can simply download the digitized pattern you want, load your fabric and mat and get cutting. All the measuring is done for you. This is one of the newest Cricut maker projects available through Cricut and really can cut your time spent cutting in half. 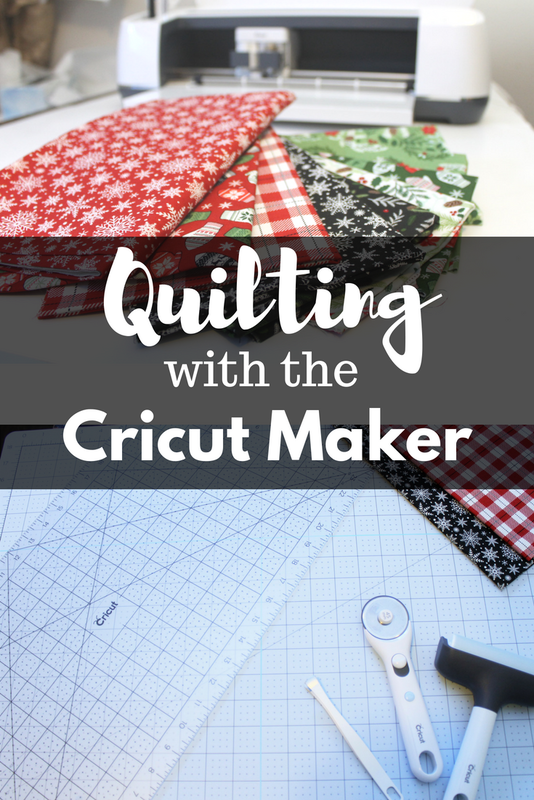 I thought today I’d walk you through the process I used to find the quilt designs, pick one and get it ready to load it on your Cricut Maker. Also, some of the tools I’ve been using to get prepped and ready for my new Cricut Maker quilt. First, let’s talk about finding the quilt pattern. 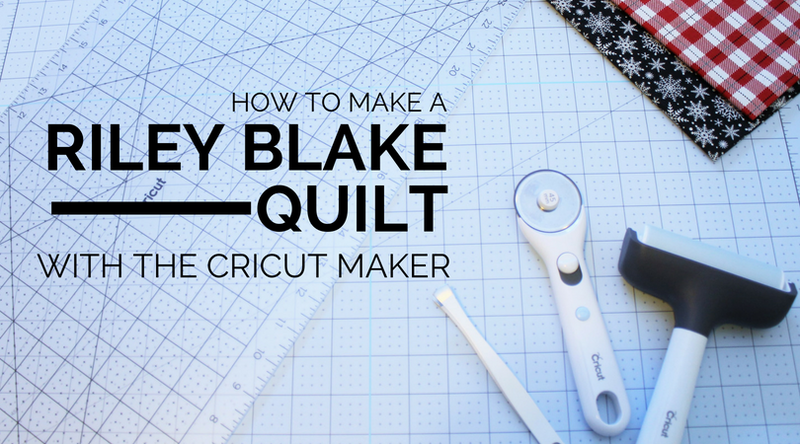 I put together this little video tutorial for how to find the Riley Blake quilt patterns in Cricut Design Space. Sometimes it can be tricky to sort through all the products available in Design Space. So I’ll show you the quickest way to find them. I'll also show you where you can purchase your own Riley Blake quilt kit for each of the different quilt patterns. Check out the video at the top of the page for details. Make sure your pop-up blocker is disabled or you won't be able to see the video. Next, you have to decide on which of these great Cricut Maker quilts you want to create. I really wanted to make a themed quilt for Christmas. It’s something I’ve wanted to make for years to put on the back of my couch during the holidays and use next to the fire. I thought this was the perfect time to try it out. After browsing through all the Riley Blake quilt patterns, I was trying to decide between the Big Star Throw quilt, the Home Throw, or the Star Burst Throw. It was actually a really tough decision. And I might actually have to come back and make the other two. But in the end I decided on the Big Star Throw. I liked the design of the Big Star Throw because it incorporated a lot of fabrics, but also because the stars were so large. I really liked the look of the stars. Next, I had to decide on which Riley Blake quilt kit I wanted to use. Lucky for me, Riley Blake also has the Comfort and Joy Quilt Kit available through Cricut. This is a gorgeous kit that includes some of the prettiest holiday fabrics. I personally really LOVE the red with snowflakes. I am a total sucker for white snowflakes on red. It can be fabric, dishes, clothes, cards. Whatever and I’m all over that. So I was totally sold on this quilt kit. The great thing about this Riley Blake quilt kit is that it has exactly the amount of fabric you need to create the Big Star Throw pattern. You don’t even have to follow the fabric cutting chart amounts because it comes right to your door with the fabrics you need. However, like most quilt kits, it doesn’t include the batting or backing fabric, but you can either order that online or find something you like at your local retailer (or in your fabric stash). Once I had decided on my Riley Blake Quilt pattern on my quilt kit, I ordered it and it arrived super fast. Then I was ready to prep my fabric for cutting. I have some really great tools from Cricut that make this process super fast for all your Cricut maker projects. Yep, that is right. 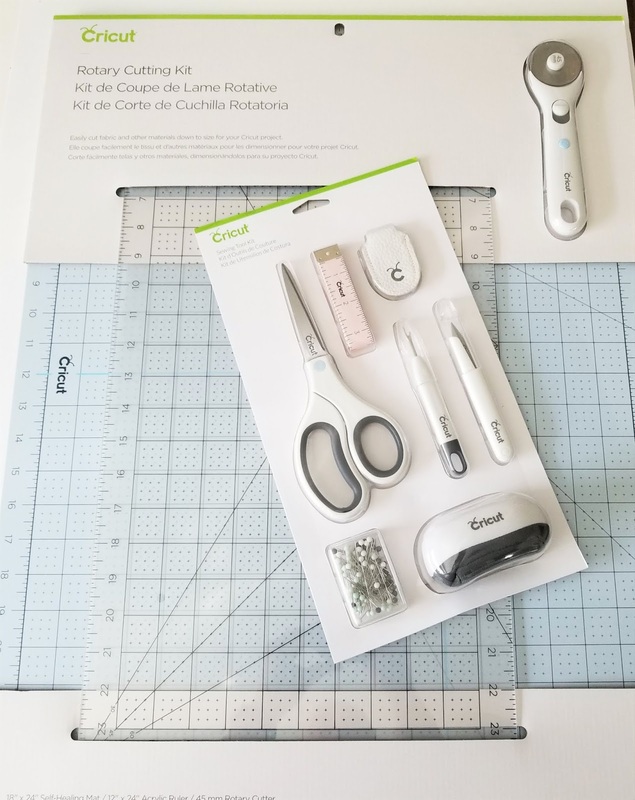 Cricut has tools for us die hard sewists! They have several great self-healing cutting mats. They are also a good size and can be easily stored under a sewing table or bed. Cricut also has a rotary cutter and a giant quilt ruler that I never knew I needed. But now that I have it I feel like I need it for all my cricut maker projects. This ruler is 12” wide which is perfect for cutting your fabric to just the right width for your Cricut mat. Very convenient for sure. I also have this Cricut Brayer. This is a great tool for smoothing out your fabric onto the fabric mat. I also have this great little Cricut Sewing Kit. I think this sewing kit would be such a great gift for a new sewists for Christmas or birthdays. Everything is good quality and will last a lot longer than some of those you might find at other retailers. Now I’m all set and ready to get cutting out my Riley Blake quilt kit with my Cricut Maker. 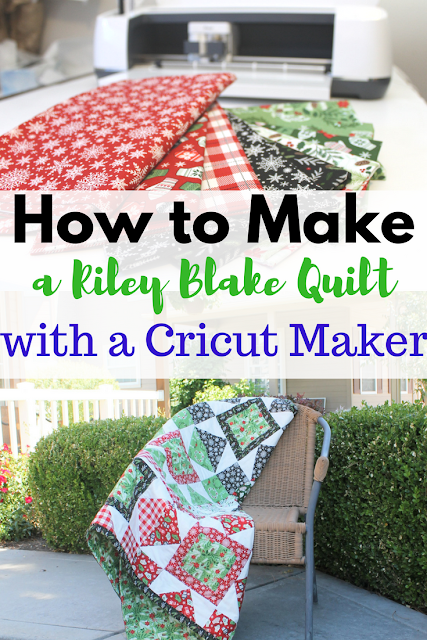 You can see the finished quilt project and great tips for piecing a quilt and check out my tips and tricks on How to Cut Out a Riley Blake Quilt with the Cricut Maker.